Why was smoke control developed? The beginnings of fire regulation started taking shape after the Great Fire of London, when the King Charles II issued a proclamation that buildings in the city should be built of stone, streets should be widened and thatch should not be used for roofs. Smoke control was formally introduced at the end of the 19th century when there were frequent large fires in theatres due to the open flames from gas lighting. Fire and smoke would spread quickly throughout buildings, affecting the tops of auditoriums particularly badly, which took the lives of hundreds of individuals. The Theatre and Cinematographs Act 1909 required Fire curtains and barriers in the proscenium to be installed and vents in the fly tower above the stage became mandatory, causing a physical barrier between the stage and the audience and venting smoke and heat to outside, containing the spread of fire and smoke to the stage area, allowing audiences to escape safely. Then, in the 1950’s a succession of large fires at automotive plants – notably GM and Vauxhall facilities – opened up discussions around what more could be done to safeguard businesses against the effects of fires. The Vauxhall manufacturing plant already had Colt ventilation vents installed and these were found to be highly effective in minimizing the effects of the fire on the building and the temperatures associated with the resultant smoke. This opened up a new avenue of research and development for Colt, who paved the way for the modern day smoke control system designs and regulations we know. Since smoke control started being researched properly, statistics have come to show that 60% of all fatalities when a major fire occurs are caused by smoke, rather than the actual fire, which underpins the absolute necessity to keep escape routes and staircases clear of smoke. Whether designing, installing or maintaining smoke control systems compliance and competency is critical to the successful deployment of the system should a fire occur. What is Smoke control and what are the key considerations when designing a system? Before we delve further into the specifics of the different types of smoke control systems and their uses, it is important to understand the distinction between smoke clearance and smoke control. Smoke clearance uses a notional amount of ventilation to assist the fire fighting operations, allowing firefighters to clear smoke from the relevant building or part of the building, often after a fire has been extinguished. Therefore, smoke clearance offers a limited benefit during the actual event of a fire or the building evacuation and as a result, smoke clearance has a much more simplified design process. Smoke control, on the other hand, is designed to help during the actual event of a fire. It is designed to remove and restrict the movement of smoke while the fire is still burning, thereby assisting occupants with a safe escape. It primarily does this by extending the amount of time that a building’s occupants have to safely evacuate, without being overcome by the affects of the smoke. In order to do this effectively, it is usually necessary to estimate the amount of smoke that will be produced, and how much heat will be generated. Therefore, smoke control system design requires careful consideration and competent designers who can specify the most effective solutions. At Colt, we take a conservative approach to designing our systems to suit the project and this may be by basing them on the assumption that a fire would have grown to its peak and stays there throughout its duration. Thereby we know that our systems are robust enough and will keep smoke above people’s heads the whole time. Sprinkler systems will help to control the growth of a fire, when activated. In that sense, they are obviously very beneficial in the event of a fire to controlling fire damage. However, it must also be noted that sprinkler systems do not limit or control smoke in any way – this is purely done through smoke ventilation systems. Sprinkler systems can actually make visibility worse in the building as large volumes of spray, steam and ‘mist’ are created. Further, if the sprinklers fail to check the fire spread, heat will building up at roof level, more sprinkler heads will activate and the water supply will become depleted. Smoke ventilation systems remove this heat from the building, limiting the number of sprinkler heads that operate to those directly above the fire. Therefore, the two will work best when they have been designed to work in conjunction with each other. 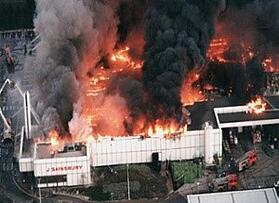 It is not advised to rely one just one or the other as a fire safety system. Natural ventilation has the benefit of not requiring any power or any other functionality to work, (apart from the vents being open) as the smoke just escapes under its own buoyancy. They also have the added benefit of being ‘self-compensating’, meaning the hotter the smoke gets, the more effective the ventilators work, due to the increase in smoke buoyance caused by the heat. Mechanical systems extract at one rate only, so regardless of the amount of smoke, it will be extracted at a steady pace. Mechanical systems are also designed to extract smoke at a certain temperature for a set amount of time, eg. 300 degrees Celsius for 1 hour. With natural ventilation, these constraints do not apply. Mechanical systems have the benefit of not being sensitive to wind effects, as natural ventilators are. Plus, mechanical ventilators can be ducted, which allows them to be used in multi-level buildings. It must be noted that because of the power-reliance that mechanical systems have, it is standard practice to provide fire-rated wiring for them, a standby power supply and a stand-by unit, in case of fan failure. Smoke reservoirs – what are they and how do they work? Smoke reservoirs are areas where smoke is contained – they are required to limit the spread of smoke through a building. 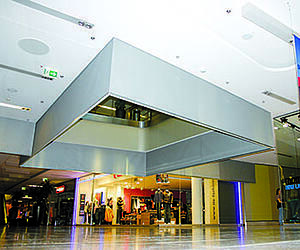 They are formed by using fixed or automatic drop smoke barriers. These barriers are arranged to limit the size of the smoke reservoir at high level to control the amount of smoke spread in the building. Typically, smoke reservoirs are restricted to a maximum plan area of 2000/2600 sq metres and to be 60m long in any direction. In shopping centres the reservoir is assumed to be 50% in the shop and 50% in the mall. Depending on the type of building you are installing your smoke control system in, you will need to take certain precautions and adhere to particular standards and regulations. A certified, competent smoke control provider can conduct a thorough building survey and give you all the information you need to make the right choices. If you manage or own such a building, organise a free building survey with our highly skilled team today. They will ensure your building is properly equipped and that the systems have been installed and maintained to work properly in the event of a fire. As with many fire safety systems, the concepts of smoke clearance and smoke control are quite straightforward, However, as life-safety systems, they must be robust and comprehensive. The design and equipment must be specific to the building-type and the installation and maintenance of the equipment must also be carried out by a very competent team to ensure the systems work properly when required. As the pioneers of smoke control system design, there is no-one better equipped than Colt to design, manufacture, install and maintain your smoke control systems. Contact our team today if you need help.